11:00 † Easter Morning Communion with Sunday Club groups for children and young people. We're sorry we're not able to do tea/coffee after the Service as usual, due to expected large numbers, but if you need refreshments for a health problem please see Pat in the kitchen after the Service. Easter Prayer, Praise & Holy Communion. After the Service please join us for hot chocolate and cake. After the Service please join us for tea/coffee in the Cafe. 11:15 † Rev. Nick will lead Holy Communion by Extension from St. John's at inSpiration at Westfield (at the end of the corridor by Nandos). 13:00 ST. JOHN'S ANNUAL MEETING. A light lunch is provided. Everyone is invited to attend - people on the Church Electoral Roll are entitled to vote in elections. The Meeting will end at 14:30. Nomination forms should be pinned to the Special Focus Noticeboard before the start of the meeting. Prayer, Praise & Holy Communion. 20:00 Meeting for Young Leaders who want to be involved in the 18:30 Service on 12th May. Easter Sunday Parking : Cars are normally parked so everyone can get out easily. On Easter Sunday morning, due to expected large numbers, we stack-park the cars - this means people have to wait for cars behind them to move first. If you need to leave quickly after the morning service you're advised to park in near-by streets. Official Church Ministers' Holiday Week : There is no daily prayer in Church, no Tuesday Morning Bible Study, no Healing Cafe, no Tuesday Lunchtime Service, no Bible In A Year, no Further Bible Study and no Thursday Lunchtime Communion. New Curate : We are delighted to confirm that Dan and Ellie Scott will join St John's Ministry Team in July 2019. Dan will be ordained in September and will have the special responsibility of planting a new church congregation (not a building) at the end of the High Street. The new Church will be called Christchurch Three Mills. Dan and Ellie have 2 daughters, and are currently members of All Hallows Church, Bow. There will be a chance to meet Dan on 29th April when he will join us for a Prayer Walk around the new area - meet at 19:30 by the green at Bisson Road E15 2RD (where there is parking). Message from Maxine : The Young Leaders group will be having a bowling social at All Star Lanes in Westfield on Saturday 27th April at 17:00. Costs - for bowling only, £10.50 on the day, £9.95 online. If you're interested, please contact Maxine. Fellowship Lunch : The Women's Group are having their Fellowship Lunch on Sunday 12th May after the morning service in the Christchurch Room at 13:30. People are requested to stay in Church until tables are set (thanks for your co-operation). Meals are served by waitresses at tables. It's a set meal at £3.00 for Adults and £1.50 for children. The Menu is Savoury Chicken with Jollof Rice OR Vegetable Curry & Boiled Rice, mixed salad & Coleslaw optional. Apple Pie OR Fruit Tart & Custard. Fruit Punch. Tickets are available from Pat Larocque or Sharon. Health & Safety : Adults please make sure you supervise your children after the Service. Please don't turn your back, even for a moment, because there are lots of hazards - candles, hot liquid (tea & coffee), the band area with musical instruments and electrical cables, stairs, the open church door and many more. Please see above for any changes to items below. Tuesdays at 13:10, Lunchtime Service. A 20 minute service with a hymn, a short talk and some prayer. Thursdays at 12:40, Communion Service. Tuesdays 11:00 to 14:30 in the Café. Everyone welcome for FREE tea, coffee, prayer, chat and mentoring. 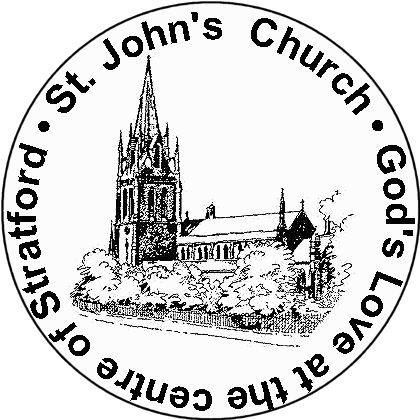 Various groups for adults and children meet at St John's during the week. See the notices above and contact the Church Office for more details. You don't need to register, just turn up. You can also find St John's on Twitter, on our Facebook Page and on Instagram. Please follow, like, join & subscribe. The Ark (for children aged 1 to 3) Babies are welcome in this group if an adult stays with them for the whole time. Visitors please sign our Visitors' Book after the Service at the Welcome Desk. New members please collect a Welcome Pack for newcomers after the Service. Rota/Mail for Church Members Please look on the table. The library is a resource for people who are studying, people leading Bible Studies, Sunday Club leaders wanting background information etc. To look at the books you need to phone the Church Office and arrange a time when the room is available.